In one of our last guild meetings (Kitsap Quilters Guild), the speaker said that every quilt has a story, a reason for its existence. I couldn’t agree more. 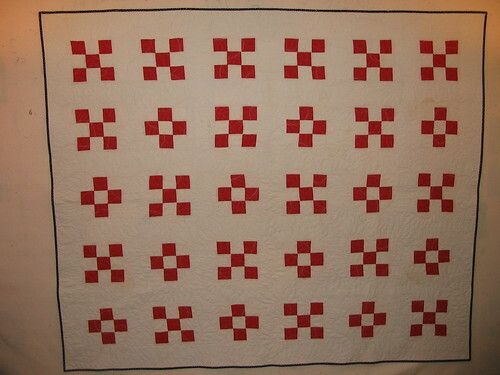 Sometimes it is the story that is the most compelling part of the quilt . Maybe that’s why I love vintage tops so much. 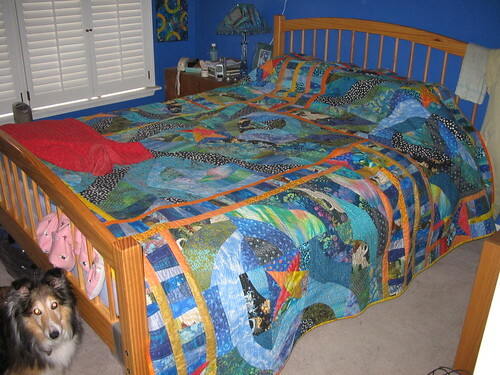 I always wonder about who made the quilt and why, who they had in mind to give it to, and whether I can quilt it the way they pictured it finished. 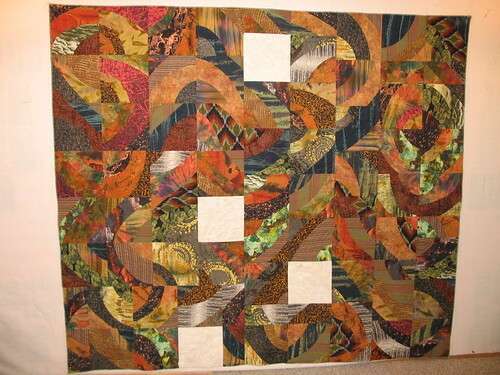 So this is the story behind one of my recent quilts. I quilt a lot for clients so it doesn’t give me much opportunity to finish my own quilts, and then it’s even rarer for one of my quilts to stay in the studio long enough for me to take pictures and post it to the flickr gallery. But this one I did take pictures of. It’s a birthday quilt I did for my dad, who has always held a special place in my heart. When he visited a few years ago, he got to see my studio and all the sewing machines (he even fixed the lights on my longarm, which no one else had been able to do!). He also saw my fabric collection, which is at its best eclectic. I favor wild contemporary prints, the larger scale the better, the bolder, deeper colors the better. But I also love black and whites, polka dots, stripes, great geometrics, and love love love those gorgeous Kona Bay Asian prints. And of course batiks. There aren’t a lot of solids in my stash (but there is a bucket labeled ‘solidish’). Not a lot of fabrics to rest your eyes on and compose yourself before wildly dashing off to the next jolt of color. My dad has more conservative tastes. 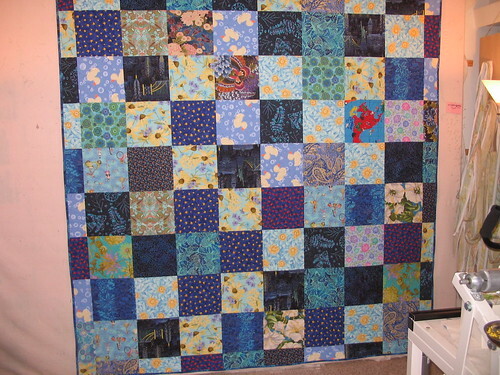 When I asked him about a quilt for his room, he said he would just like it to be blue. Blue as it turns out is one of my very favorites (okay it’s the colors between green and blue that really float my boat, gotta love those turquoises!) so I have three buckets of blue, so we were good to go on that front. But I thought blue by itself might be boring so it needed some yellow. 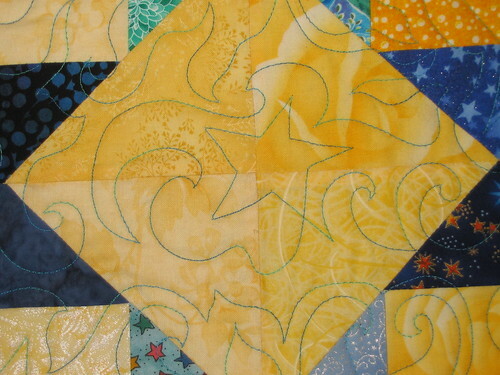 Yellow and blue is a classic quilt color choice, yes? It could look kind of traditional if I tried. Hard enough. I went off to collect some yellow (not having even a quarter bucket full) and picked a pattern by Bonnie Hunter at Quiltville.com. Her Pineapple Blossom is lovely and she has some fantastic stitching shortcuts that make the sewing fun and breezy (plus you get bonus triangles!!!). It’s a sort of half-pineapple, and if you don’t know what that is, it’s a lopped off log cabin with triangles on the corners (in this case, on opposing corners only, not all four corners). Those triangles get you a secondary diagonal pattern which just plain old rocks! 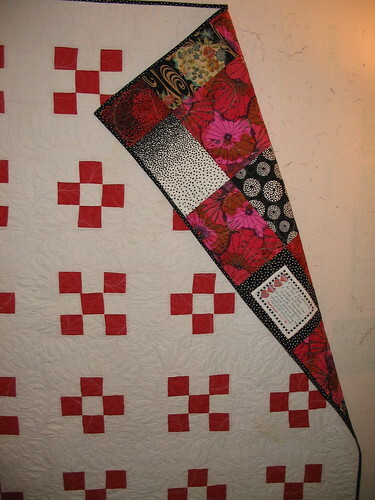 I left off the sashing to let the diagonals meet. 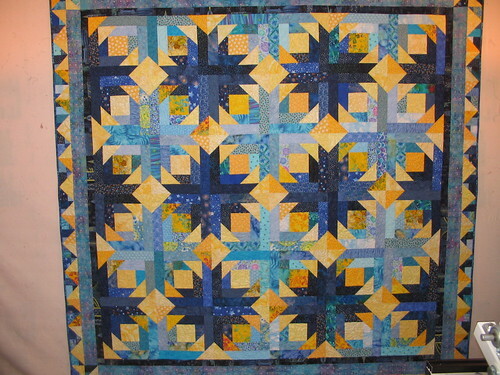 Instead of just using any old blues, I used lights and darks, alternating on either side of the block. So then there are pronounced diamonds of light and dark blues set off by the yellow diagonals. It came out a bit brighter than I intended, but it felt like the quilt was infused with liquid sunshine, and it made me smile. For the back I picked 10 inch squares of alternating lights and darks in blues. I didn’t have enough of the one fabric I wanted to use for the back so piecing it out of the three buckets of blue worked a lot better. One of my favorite fabric designers is Martha Negley and her cone flower print (in yellow flowers on a blue background) I just loved, but only had a yard and half, so I matched the colors of that for the other fabrics. Cone flowers are known for their healing abilities and since my dad had been struggling with his health, I thought this might be a nice thing to add to his quilt. Plus I figured if the front was too bold and graphic for his tastes, he could turn the quilt over on the back and use that side instead :). My stepmother I knew would love both sides so she’d be happy with whatever I made. 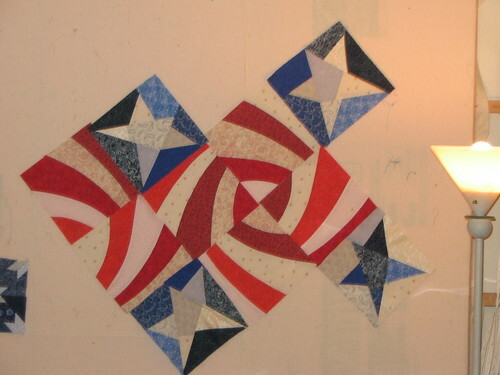 The bonus triangles you get from this pattern are a blast and I used them in the border, and still have a stash for my next Frankenquilt (quilts made of cast off spare parts from other quilts). I found a New York print with the Statue of Liberty and bound the quilt with that (and use it for a narrow border as well). I quilted it with a celestial moon and sun pantograph pattern on my longarm (pattern is Celestial Stitches by Kim Darwin, available here from Longarm University) and then showed it off at the guild meeting. Even though it was past my dad’s birthday, I felt an urgency to finish and send it to him that I hadn’t expected. Before I could even get it in the mail, I got the call. 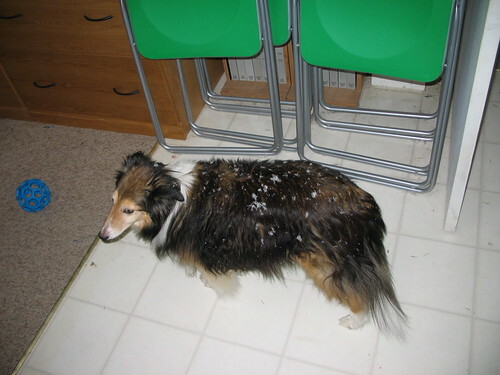 My dad’s brother had died quite suddenly, by suicide. He had a construction company and the economy had killed off his business, and he couldn’t face the consequences. 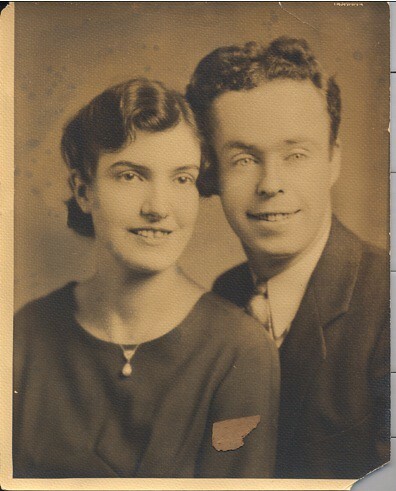 My dad was devastated and from across the country there was very little I could do to comfort him. So I sent him his quilt. When he received it, he just loved it, wild fabrics and all. He loves the colors and pattern, and especially loves the fact that I made it for him. He said that it makes him feel much closer to me, to have the quilt in his house, and that he really appreciate the time and care, especially when things were so difficult for him at that time. 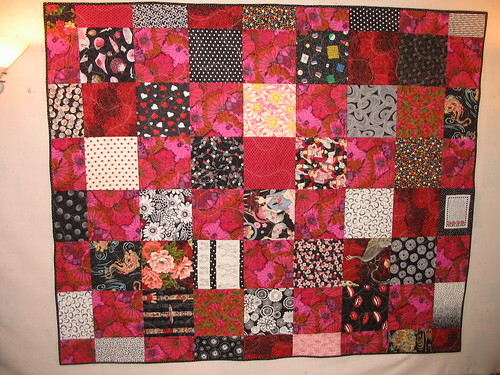 So one quilt. One story. Many families. It’s why we do what we do. A lot of people have asked me where the White Lotus name comes from and what it means. To explain I’ll have to tell you a little about my Kwan Yin quilt project I did for a recent art show. The Kwan Yin quilt hangs in my office now and I look at it every day, and a small portion of its center section is shown above. (You can see the rest of it in the OH MY GODDESS! virtual tour). 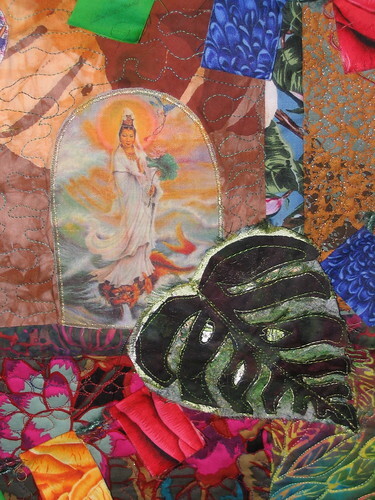 Kwan Yin is the Chinese goddess of compassion, and her image through several cultures is reflected in the center of the quilt, which I constructed to look like a meditation pond. Serene koi float in the pond, behind leafy green fantasy leaves that sprout three-dimensional water lilies or lotuses. Miniature prayer flags drape over the still silent water, and you can almost hear their fluttering in the breeze. Her Chinese image is shown above, and there is also an image from Japan (Kannon) and from Tibet (Green Tara). She is known as the ‘one who hears the cries of the world,’ and it is said that she has vowed to stay outside of heaven, tending to the mortals of this world, until there is no more suffering to alleviate. Likewise she sees the good in all, even in those things and people that we have a hard time seeing beauty in. 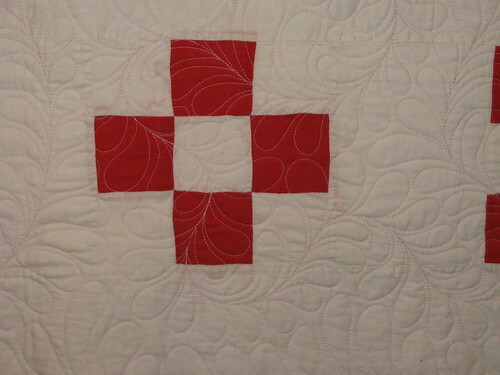 On my quilt there is a giant eye at the top, complete with center mirror, to signify the eye that sees the good in all. At the bottom is a section that represents the story of the shattered sword. Kwan Yin’s compassion is said to be so deep that if one were about to be executed, and cried out to Kwan Yin in sincerity, the executioner’s blade would fall shattered to the ground. I respect and admire this deity because she embodies so much of who I strive to be. In my work, I want to see the best in every quilt, honor each and every creative impulse of my clients, and make their pieces shine. In my personal life I want to open my heart to the suffering of others and alleviate it, even if in some small tiny way. Kwan Yin is often associated with the white lotus and is sometimes depicted carrying one. It is a symbol of enlightenment and healing. When I went to choose a name for my business it seemed the obvious choice.